These beans are also known as the broad beans, field beans, bell beans, Horse Beans, Windsor Beans ortic beans, which are a species of flowering plant in the pea and bean family Fabaceae. They are in season around Mach, April, May and some times in June. They are rich in protein, folic acid, phosphorus, magnesim, potassium, iron and sodium and although this healthy dish is vegan it surely is one of the most nutricious food, packed with lots of other nutrients. The dish is vegan but for a vegetarian meal serve them with some feta and lots of crusty bread! Fava beans go way back in history as they were known in antiquity. “These beans called κύαμοι= “kyamoi” pr. KHEE-ah-mee, in ancient Greek, were very important to the Greeks. Homer himself mentions them in his epics, while archaeologists still continue finding them in archaeological excavations, as the dried beans can endure for a long time. The ancient Greeks cooked them in various ways and served them with vinegar or made them into a purée. Mixed with olive oil and spread on a slice of bread, the ancients enjoyed a wonderful snack packed with lots of nutrients. The dried beans were also eaten as snacks along with onions, garlic and chickpeas. Surely some ancient eating habits may sound disturbing to our current sophisticated preferences but tastes change during the millenia. Many times, the dried beans were eaten during theatrical performances, as we do in contemporary years when we eat salted roasted pumpkin seeds (called passatempo for the Greeks, which is actually two Italian words which mean to pass your time), salted chickpeas (koudames or stragalia) or popcorn when going to the movies. The hungry viewers who watched all these comedies or tragedies tamed their hunger by eating these dried beans. If the theatrical plays they watched or the performance of the actors did not satisfy them, they would throw them to the actors, along with the cushions they sat on! Also, another use of these beans for the ancient Greeks was to use them as “pieces” when playing board games. Another important use the ancient Greeks had of beans was to use them during elections. There were two kinds of beans, ones were white and the others black. Those who voted in favour would cast a white bean and those who opposed a black bean. Until today there are expressions in the Greek language relating to the word bean in elections. The above information is translated from: Back to nature. In our garden we have planted some vegetables, such as onions, garlic, artichokes, broad beans, peas, mint, basil, coriander, fennel, dill, rosemary, Kafkalithres (Tordylium Apulum or Mediterranean hartwort) and Myronia (chervil), which are two of my favourite herbs, as welll as lavender, fragrant geraniums, which I love using in my fruit preserves or jams etc. I’ve recently used Rosemary, Lavender and Fragrant Geraniums to make Aromatic Salt. Many people think that fava beans are toxic but they are not. The truth is that some people are intolerant to an enzyme produced by the fava bean and can be very toxic to people who suffer from favism. Fava beans can cause hemolytic anemia — an abnormal breakdown of red blood cells — in people with an enzyme deficiency called Glucose-6-phosphate dehydrogenase (G6PD) deficiency. For people who do not have this deficiency, they are a great source of protein and carbohydrates, as well as vitamins A, B1 and B2. When I was a kid I heard all sorts of stories that people died eating them, so whenever my mother cooked them, I found this excuse to avoid eating them, as I did not like them. In fact this is the first time I have ever attempted to cook fresh broad beans! Eat their pods or not? Let’s clear this topic as there is so much misconception over the internet. All, yes ALL recipes say that you have to peel the beans and eat the seeds ONLY! What? Why? Are they kidding? Fava beans are eaten whole, with their pods just like you would eat any other fresh, green beans. What a waste of delicious fresh food! They are very easy to be cultivated during Automn and they are ready to be consumed around spring or early summer. So, depending on the month you plant them, they are ready to be eaten about 3 months later. However, at the end of their season, their pod becomes thicker and tough, so this is the only time that you would discard the skin and eat only the seed! As easy as this may be, there are surely many people who do not cook fresh fava beans because they do not know how to clean them. Cut the two ends and using a vegetable peeler or a knife peel around the pod in order to remove the string. Then cut it into smaler pieces. If the fava beans are off season, just snap the top and cut along the seam. Slide your finger along the seam so that it breaks open and remove the seeds. Although the fava beans I used in the video are very tender, I used one of the biggest to show you how to do it. There are several ways to cook broad beans but for my first recipe, I cooked them similar to the way I cook “anginares à la Polita“. Dill (anethum graveolens) called άνηθος = “anithos” in Greek and wild fennel, called μάραθος = “marathos” in Greek (Foeniculum vulgare) together with parsley and lemon, add a wonderful flavour to this dish. 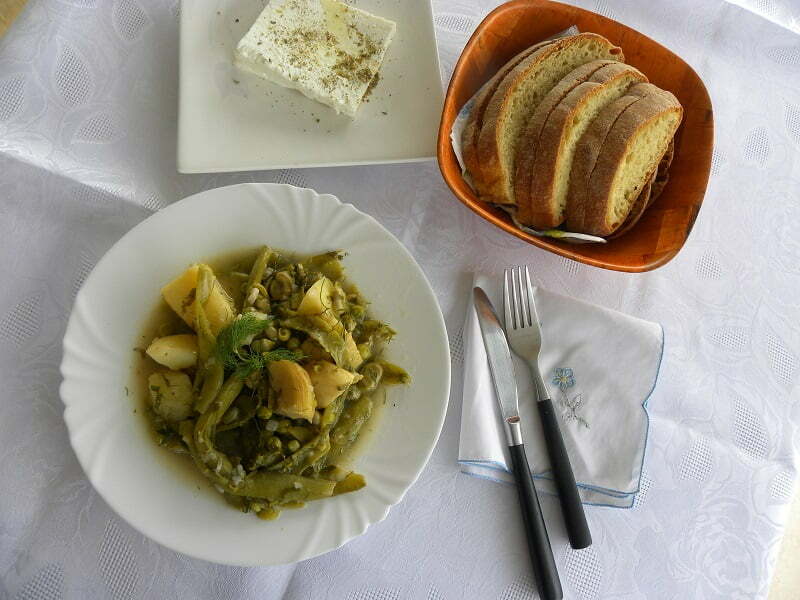 In Cyprus koukia (fresh fava beans) are cooked skordoxιdκia (σκορδοξιδκιά), which litterally means fava beans with vinegar and garlic. My mother would cook the fresh fava beans until tender and then she would saute some garlic in olive oil, added some flour to make a kind of garlicky roux, in which she added some vinegar and broth until it became a thick batter which she then poured in the pot to thicken the sauce. I did not make a roux but when the dish wass cooked, I dissolved some flour in the lemon juice, to make it lemony but also to thicken the sauce. Peel the broad beans (video above) and shell the peas. In a saucepan heat the olive oil and sauté the onion until soft. Add the garlic and cook for 3 to 4 seconds, until fragrant. Add the broad beans, artichokes, peas, and potatoes and mix. Bring to a boil, lower heat and simmer for about 45 minutes, or until the potatoes are soft. Add the parsley, dill and fennel fronds and season with salt and pepper and mix. Dissolve the flour in the lemon juice and pass it from a sieve or strainer to break up any lumps. Add it to the fava and cook for 15 more minutes, until the sauce thickens. The sauce will thicken more as it cools.